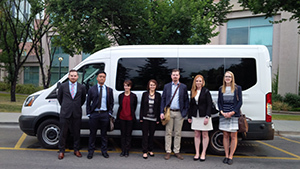 Law students from the University of Calgary will be boarding the first Job Shadowing Justice Bus today and making their way to Brooks, Alta., to gain hands-on exposure to the day-to-day operations of a legal practice in the rural part of the province. “A lot of people want to do it because they moved to Calgary from different areas of Canada and now want to stay in Alberta,” says Amber Bishop, a 2020 MBA/JD candidate who will be one of the students on the bus. Bishop says a lot of students who want to work in rural law firms won’t be able to visit them or move there until after they’re done school. The bus — an Alberta Rural Law Opportunities initiative of the Alberta Rural Development Network, a not-for-profit partnership of nine Alberta colleges and universities — is a way to address this problem. The firms involved include Quick Click Law, divorce and criminal law firm Bullock Law; Stringam LLP, a regional firm with offices in Beaverlodge, Fort McMurray, Grande Prairie, Lethbridge, Medicine Hat, Raymond and Taber, as well as Brooks; Susan Robertson Law Office; and Shantz Law Office. ARLO, which has a separate website, matches law students with summer and articling positions in rural communities, and also encourages rural lawyers to “make positions available as a way to ensure the succession of their practice and accessibility of legal services in their community.” The Job Shadowing Justice Bus is the most recent initiative to this end, made possible by the sponsorship of U of C and the CBA’s Alberta branch. According to an announcement in the Prairie Post, participating in the Justice Bus initiative aligns with U of C’s stance as a proponent of experiential learning activities. “This job-shadowing project complements our existing outreach in regional and rural communities, as well as our annual Small and Regional firm day and Window into Small Firm Life panel,” said Madeleine Natale, Career Advisor at the Career and Professional Development Centre of the University of Calgary Faculty of Law. While many people have heard of the challenges that rural Alberta communities face with the succession and retention of doctors, not many realize the same communities face similar challenges with lawyers. The U of C law students will shadow lawyers and office staff at the Brooks law offices and enjoy a networking luncheon at the Brooks Golf Club restaurant which was sponsored by the CBA Alberta Branch. The bus left the university at 6 a.m. this morning and arrived in Brooks at 8:30 a.m. The students will return to Calgary at 7 p.m.
“I didn’t work in a law firm this summer, so for me personally I just want to have the opportunity to meet people during the summer that I wouldn’t otherwise have because I spent the entire summer away from that cohort of people,” says Bishop. Students were assigned a lawyer to follow throughout the day and were connected to the lawyer prior to the visit. Swan is heading into 2L in September and had attended a couple of the ARDN networking events throughout his first year, where he says there was a “decent showing” so in his opinion there’s definitely interest from law students in heading to smaller centres. When the ARDN emailed him about the Justice Bus opportunity, he wrote the required letter of interest, applied and was accepted. Swan was interested in the opportunity because he says he has no knowledge of the legal field at all, having grown up on a farm in Breton, Alta, a village about 95 kilometres from Edmonton with a population of 574 people. Swan says he likes the small town life and wants a taste of what it means to be a rural lawyer, although he’s keeping his options open. The Justice Bus pilot project is “gaining traction” and there are plans for a second bus trip Aug. 31 to a firm in St. Paul, a town in northern Alberta, for University of Alberta law students.